Flights between Cornwall and the Isles of Scilly are to continue from Newquay until at least the weekend, an airline operator has said. 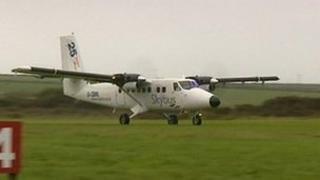 The Isles of Scilly Steam Ship Company's Skybus service has been flying from Newquay Airport since last week because of a waterlogged grass runway at Land's End Airport. The company had hoped to resume services from Land's End on Thursday. It said it would review the situation on Saturday. A passenger ferry, the Scillonian, only runs in the summer. British International Helicopters stopped its year-round service on 31 October after running into financial problems.